In the past, iPhone users were able to brag about the superior quality of applications only available for IOS. However, Android users can now rejoice because many of the best applications are now available for both operating systems. Now that the Android market has nearly caught up to Apple, smartphone owners can collectively ask which apps are the best and most useful additions to their handsets. The first must have application is Any.Do, and the best part about it is that it’s free.Any.Do is an extremely useful application that reminds you of tasks that you have to complete throughout the day. It is an example of how such a simple application can have dramatic effects on one’s life. This application is sure to make its users far more efficient and organized in their daily lives. Another useful little application that has actually become quite essential for sharing things with friends is called Bump. Bump allows iPhone and Android users to share any sort of media with their fellow smartphone owners by simply bumping their phones together. Using Bump makes transferring files far more easy and efficient, and most importantly fun. The best part about this application is that, like Any.Do, it’s free. 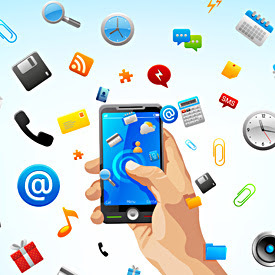 While these two applications illustrate how useful some of the free applications can be, smartphone users should also get a chance to have some fun with their devices. Turntable.fm is a fun little application that allows users to take turns being a DJ with their friends. The way it works is that each user takes turns selecting a song to play, which is then played on each users smartphone. Turntable.fm is free on both markets, which gives smartphone users no excuse not to pick it up. Finally, an article on the best smartphone applications wouldn’t be complete without a game. While Minecraft: Pocket Edition isn’t free like the previously mentioned applications, it is one of the best values on the app market. Minecraft is a game that allows users to build anything their heart desires in an enormous world. This game offers the nostalgia of childhood with an experience that is reminiscent of playing with Legos. Any Android or iPhone users can pick it up for the incredible value of seven dollars. Mike Jones is an avid blogger,who writes for Puremobile.com. He loves technology and video games. He currently spends his life keeping up to date with the latest news in technology and seeking out new opportunities in wholesale cell phone accessories.